Naughty Jack Frost promised not to trouble the Rainbow Fairies again, but he didn’t say anything about the Weather Fairies! Now he’s stolen the feathers from the weather-vane cockerel in charge of the weather. It’s up to Rachel and Kirsty to get each of the feathers back from Jack Frost’s pesky goblins… with a bit of help from the Weather Fairies! Evie the Mist Fairy is lost in the fog without her magic mist feather. 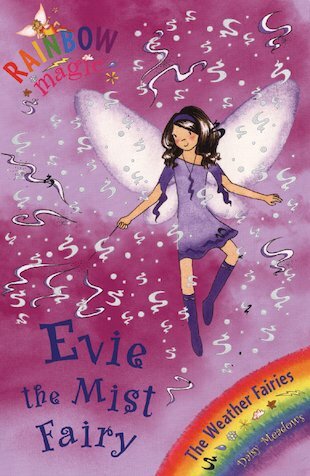 Can Rachel and Kirsty help the frightened fairy to get out of the shadowy forest? This is my first rainbow magic book. The book is good but I think it’s better for younger kids. Sometimes I even got bored and put the book away. Well anyways, it’s good. It’s written by Daisy Meadows. Evie has to control the mist. I absolutely love it!!!!!!!!!! !Really Good!